Staree – Make Money Sharing Photos and Videos | AdsWiki - Ad Network Listing, Reviews, Payment Proof & Advertising News. In the world of social networking, posting pictures and videos online, and anything to do with celebrities… you simply can’t go wrong. So what happens when you combine the power of all three of these mega attractions? Then you get Staree! 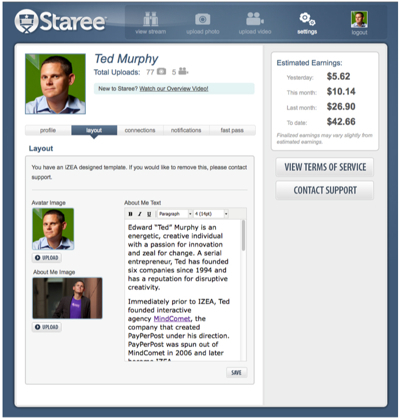 Staree is the latest project behind the team at Izea, and their goal is to make a one stop resource for everyone who is already using Twitter, Facebook and Klout, but also enjoy having their own profile pages and getting paid to share their updates and photos/videos with friends. One of the main attractions at Staree is their connections with the entertainment world and all of the celebrities that they will soon have flowing through the new social network. With mega celebrities like Kenda Wilkinson, Bethenny Frankel, Khloe Kardashian already working with Izea, I’m sure it will only be a matter of time before Staree has a powerful celebrity user base. For now, Staree has closed the doors on their beta launch and have now opened registration for everyone else who would like to get active on their site. You can see my profile page in the screen shot below. Staree has a mobile application that makes it extremely easy for you to share pictures and videos from your phone, then instantly post them to your Staree page. Anyone who visits a Staree profile page will also be able to easily contact the person through their Twitter, Facebook, Ask Form or leave a comment below any updates. In addition to being another social networking site where people can post and share content with friends, Staree stands out from the crowd by not only allowing members to have a custom look and feel to their profile pages, but also that you can earn money in the process. As mentioned, Staree also has a mobile app, which allows you to update with text posts, photos and videos… something many other apps like Instagram don’t currently offer. 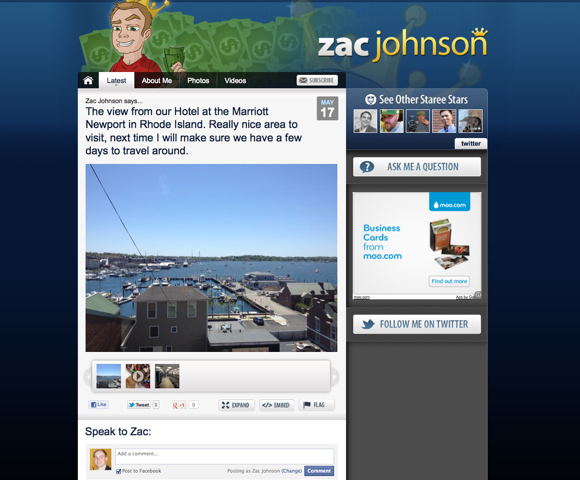 Yes, just like all of the other component of Izea (Social Spark and Sponsored Tweets), Staree is also focused on creating an excellent user experience while also rewarding their users with compensation.John Chow also wrote up a post on Staree and he has already earned money in his account, just from posting a few pictures over the past three days. You can see a screenshot below of Ted Murphy’s account area and how earnings and profile settings are setup. You can also upload photos and videos through their web site in addition to using their mobile app. With the official launch of Staree today, they are sure to be flooded with new signups and feedback on how to make their site and service better. It will be great to see how many new celebrities and users sign up to use the service and see how they will compete and grow along side Facebook, Twitter and Klout in the coming months. I recommend you go and setup a free account with Staree.com today. 3 Responses to "Staree – Make Money Sharing Photos and Videos"
I want to know about the payment method of Staree.